Pomoto is a subscription service. This means that you don't pay a one-time fee for the software, but a recurring fee for the software and hosting services. Monthly and yearly plans are available, both offering the same features and benefits. All subscription payments are processed through PayPal. A PayPal account (which can be created during purchase) is required, as is a credit card. Purchasing a subscription to Pomoto is done through the Pomoto application itself. 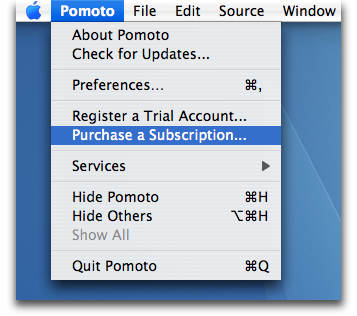 After installing Pomoto and registering a trial account, simply click 'Purchase a Subscription...' from the Pomoto menu. You will then be able to choose your preferred plan before being directed to PayPal to complete your purchase. You may cancel your subscription at any time through your PayPal account. If you would prefer, we can also cancel your subscription for you. Just send us an email. A cancelled account will function as normal until its current term has ended. Afterwards, publishing will be prohibited but the gallery will remain online for 15 days before being permanently deleted.